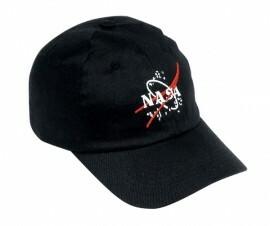 NASA baseball cap (black) - spacekids - space toys, dressing up costumes, kids spacesuits, astronaut food, cool space stuff! An adjustable black coloured baseball cap, embroidered with the NASA logo. This is a child's hat that is fully adjustable for a comfortable fit.